Turn a Tupperware into an ant farm! Get a plastic container and remove any labels if needed. 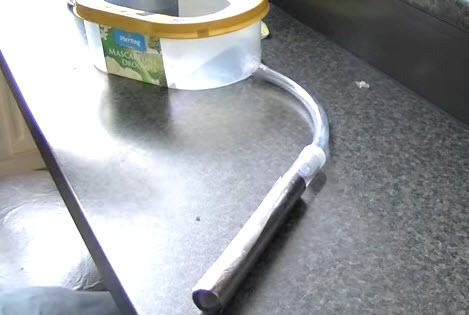 Cut a piece of clear, flexible tubing, hold one end of the tube against the side of the container near the bottom and trace the edge of the tube onto the container, then cut out the traced hole. Get a test tube that is the same size as the one your ant colony arrives in, cut off the top of the test tube cap and glue the cap onto one end of the plastic pipe. Glue the other end of the plastic pipe into the hole in the side of the plastic container. Cut a hole in the top of the plastic container, leaving some space around the edge, and wipe the inside of the top with olive oil. Wrap the test tube that holds the ants with aluminum foil and swap the cap on the test tube to the cap connected to the container.